Fiji's Opposition Leader Ro Teimumu Kepa has agreed to contest the 2018 general election. The Marama Bale na Roko Tui Dreketi has put her retirement plans on hold after she was approached to stand during a Bose Vanua meeting at Burenivudi in Lomanikoro village, Rewa Tuesday. It is understood that requests for her to contest the election came from Kadavu, Namosi, Naitasiri, Nadroga, Nadi and Ba, SODELPA USA and SODELPA supporters in Australia. Ro Teimumu is 72 and understood to be in good health. 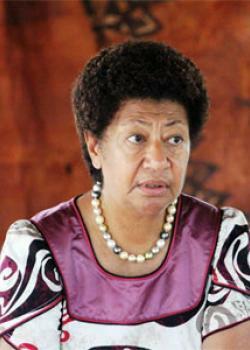 She is polling ahead of party leader Sitiveni Rabuka in the Fiji Sun public opinion poll. In the 2014 general election, she polled 49,485 votes, the second highest after Prime Minister Voreqe Bainimarama's 202,459 votes. The support for Ro Teimumu grew after internal bickering in the party threatened to jeopardise the party’s election chances. The last straw was the controversial memorandum of understanding between SODELPA and the suspended People’s Democratic Party. The MOU caught many party members by surprise and some lodged complaints to the Supervisor of Election Mohammed Saneem. Saneem ruled that Vijay Singh, former PDP president, had breached the Political Parties decree when he was elected as SODELPA vice-president on December 9 last year and that the MOU was not a merger. He also referred the matter to FICAC (Fiji Independent Commission Against Corruption). This incident has caused anxiety and more instability in the party. SODELPA leader Sitiveni Rabuka’s leadership came under scrutiny. The push to get Ro Teimumu to stand is based on the belief by many supporters that she will provide the party stability and strength. Even Rabuka, on several occasions, had expressed his desire to have Ro Teimumu in his election team. Her application as a candidate will go through the selection process. The party has already named 31 candidates. Ro Teimumu is expected to be named in the remaining 20.